Unlike their cousins, the boobies, gannets seem shy around people. This is the closest we got. First, our whereabouts: We're headed north to Manasquan, NJ. If all goes well, we'll go "outside" (into the open Atlantic!) on Sunday and cross to New York Harbor. Then Monday, we'll cruise up the Hudson to dock at the 79th St. Boat Basin. But weather can change--and so can this plan! Please check back for further updates. Earlier this week we spent two days windbound in Atlantic City. Stuck our nose out Friday and bounced north up Barnegat Bay to dock in Forked River, NJ (say "FORK-ed," two syllables, or they'll know you're from away). One aid to navigation: The more-than-300-foot-tall venting stack of the Oyster Creek nuclear plant--and more on THAT tomorrow! But today, just for fun, I want to talk about gannets. If you're NOT a birdwatcher, you're saying, "Uh, you mean the news service?" Naw, I mean the bird--the large, fast, and very interesting bird. We've seen lots of them here on the Jersey Coast, and in contrast a lot of wildlife I've mentioned in this blog (manatees, wood storks) gannets are NOT on the endangered species list. Hey, a good-news story! What? This is NOT the world's largest rooftop solar system? Well, it's definitely the prettiest. We're in New Jersey (Motto: "Second only to California in solar capacity.") The casinos in Atlantic City are over the top--and so are the solar arrays. Really. The world's largest rooftop solar system was just installed here. Before we left Cape May on Monday, we stopped at a marina for a pump-out. The dockmaster, Bob, scratched his head over our solar propulsion system. "I've got solar panels on my house," he said. "Never seen them used to run a boat!" So I'm trying to blog about alternative energy issues here! But you, loyal reader, you tell me that you prefer it when I channel trashy tabloids and offer you a bikini diet. I promise to keep delivering both. This bit of real estate is called Artificial Island. Really! We're anchored in Ocean City, New Jersey today, after a wild and windy ride north up the New Jersey Intracoastal Waterway from Cape May. 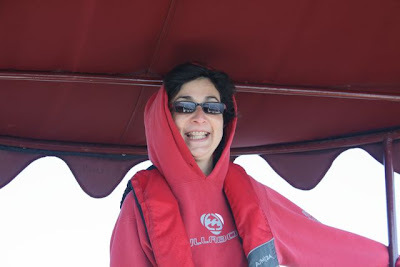 Early Monday, we were coasting down Delaware Bay with blue skies overhead but deep fog all around. And our tour of eastern nuclear plants continued! The cloud of steam from the Salem Nuclear Plant bulged above the rim of fog. Try the SlowBoat Workout. No spandex or yoga mat needed! One of the challenges of this trip is taking our boat where canal boats were never supposed to go. Like 50 miles down Delaware Bay. We had a grueling day yesterday: left early, spent long hours in the fog; arrived in Cape May late, after more long hours bouncing over the big rollers coming in from the Atlantic. Woke up bone tired, as if we'd run a marathon. 1) Anchor Lift (Clean and Jerk): Stand at the bow of the boat. Apply hands firmly to anchor line. Jerk upwards to lift 50-lb anchor (plus attached 50-lb chain) clear of muddy sea floor. When anchor is level with gunnel, hold for 5 minutes with left hand. With right hand, lift scrub brush and scrub anchor clean of mud. Repeat daily, till biceps scream. Look! 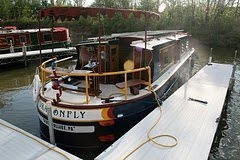 A canal boat on the C & D canal! Happy Earth Day from SlowBoat. How did you celebrate? Please let us know. On this end, SlowBoat spent Earth day docked in Delaware City, DE. Ironically, the crew were off burning fossil fuel. But we believe it was for a good cause. We attended the first-ever Berger Family Reunion. About 30 of us piled onto a yellow school bus to drive past the homesites and graveyards and textile mills that the Berger family once knew in the fading industrial towns of Lawrence and Haverhill, MA. Lawrence is the site of the famous Bread and Roses strike of 1912. The strikers, led largely by women, appealed for both fair wages AND decent working conditions (hence the slogan: "We want bread, but we want roses too.") Family founder Joseph Berger was hit by a rock and lost an eye during the strike. Now we're back on the boat and about to make a run down Delaware Bay. Did raw materials for those Massachusetts factories--wool, cotton, leather for the shoemakers--pass through this port? Probably. I was thinking about Earth Day when we first docked here last week. The water at the head of the Chesapeake--right before we entered the C and D canal--was chocolate brown with mud. And where we passed the mouths of rivers draining into the bay, the water was loaded with debris, mostly tree branches and even some tree trunks. on a canal boat on the C and D canal. Wheee! This was the scene Wednesday on the Chesapeake and Delaware Canal. The tide was coming in and we boomed along at a bracing 8 mph! Free ride! 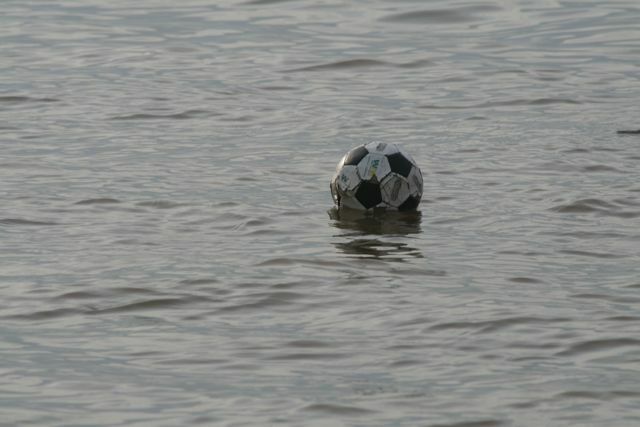 You know we never miss a canal. And this is a VERY cool one! Nearly 200 years old, and still one of the busiest in the world. It connects the Delaware Bay to Chesapeake Bay. HISTORY: Waaay back in the mid-1600s, a mapmaker from Bohemia noticed that, if you cut a canal across the 14 miles from Chesapeake City (on Chesapeake Bay) to Delaware City (on Delaware Bay), you'd cut 300 miles off the sailing distance between Philly and Baltimore. But you know how slowly governments move. Construction on the canal didn't start till 1804. The original canal had 4 locks. Teams of mules and horses towed vessels through, Erie Canal-style. In the early 1900s the canal was made deeper, making a direct sea-level connection between the two bays and getting rid of the need for locks. That's why we're flying along: High tide on the Chesapeake is pushing us through! Gotta go. My turn to steer. Great big container ships sometimes use this channel. Could be fun. Check the SlowBoatCruise Facebook page for more photos. Warning: No alternative energy news or eco-notes today, just a rant. We are weatherbound in Solomons, MD (claim to fame: More Bugeyes Built Here than any other Chesapeake Bay community). We're constantly scoping for signs of spring, and the locals told us we got here just in time. For, here in Solomons, spring arrives when the Tiki Bar opens. The Tiki Bar doesn't look like much. We went for a leg-stretch the night we got here, and if we hadn't know the place was famous we would have barely given it a first glance, let alone a second glance. But "Tiki Opening" is a big deal. All our guidebooks mentioned it. 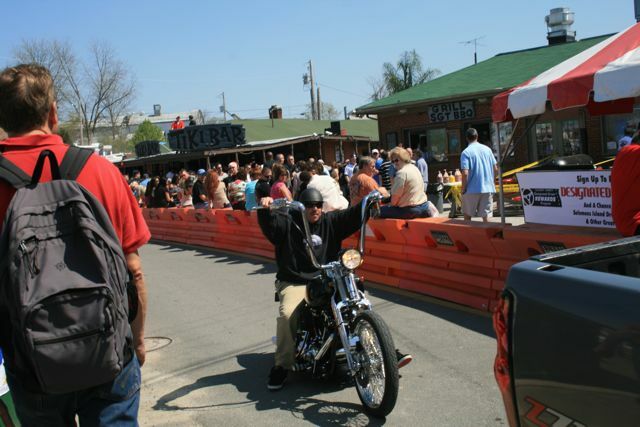 Solomons has a population of 1,500; for Tiki Opening, some 20,000 visitors show up. Locals call it "Redneck Mardi Gras." Look Ma, no cooling towers! 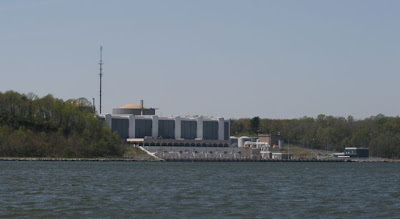 Calvert Cliffs Nuclear Plant. First: We're tied to a dock in Annapolis! Less than 10 minutes after we landed, a red tour trolley pulled up to point out "the English Canal Boat." To catch you up on earlier travels: The weather forecast yesterday was grim. "Waves 2 to 5 feet at Chesapeake Beach." But we set out from Solomons anyway, staying close to shore, in the shadow of Calvert Cliffs. And though the wind raged mightily, the water was flat. The so-called "cliffs" are low, rounded hills that look like layer cakes sliced open. Inside are fossil-laced strata of gold and brown sand. We made it to Cheseapeake Beach, where, as the sun set, a full moon boomed up over a glittering sea. Leaving the laundromat at 11 PM, I passed a woman in a business suit and sensible shoes, staring at the glowing disc and the bright water below. "Drove all the way from Raleigh just to see this," she murmured. 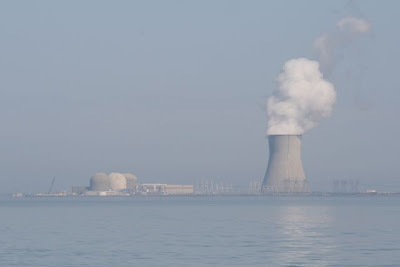 One of the more interesting sights for us on our 25-mile trip yesterday from Solomons to Chesapeake Beach was the Calvert Cliffs Nuclear Power Plant. About 3 million people live within 50 miles of this plant, including the residents of Washington DC. Built in the mid 1970s, the plant's two generators use the bay as a heat sink for cooling water. Like Edwin Way Teale, we're headed north with the spring. Our slow rate of travel means we've enjoyed weeks of bloom: redbud, daffodils, dogwood. We're in Solomons, Maryland, today and there's another kind of spring bloom here . 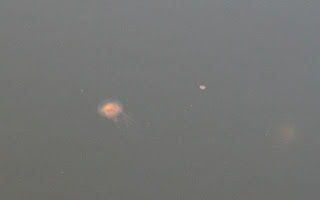 . . something quite as pretty to look, at but less pleasant to touch: Jellyfish. (Watch 'em swim here). Ever wonder where the jellyfish have been all winter? When the water gets cold, the adult jellyfish die. But their offspring have hatched . . . and developed into blobby creatures called polyps. The polyps find something hard on the sea floor, like an oyster shell, and stick tight. In spring, as the water gets warmer, the polyps bud off free-swimming jellies--the familiar, tea-cup-shaped critters you see in this photo. And hey, what with the globally warming climate trend, Cheseapeake jellies are showing up nearly a month earlier than they did back in, say, the 1960s. Both of us want to take this chance to say a heartfelt thanks for your expressions of sympathy over the last two weeks--it means so much to both of us. where the Civil War started 150 years ago this week. We've back on the boat today, and heading north up the Chesapeake. Back in Homer, Mom pointed to the map, raised her eyebrows and said, "You're going to be way out THERE?" Yup! 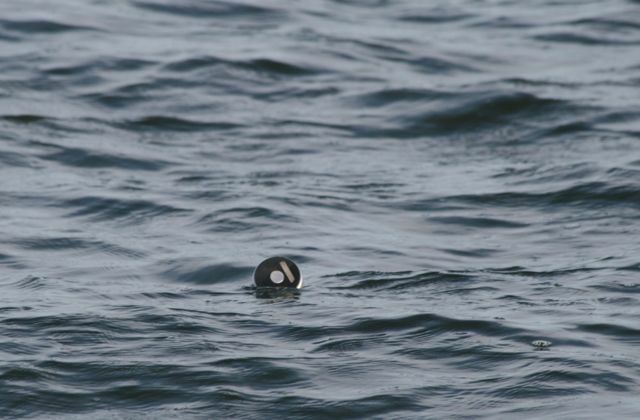 Back in the groove: dodging crab pots, waving to the Coast Guard, scoping for loons, which are starting to show their spring checkerboard plumage. Sixty-four degrees and feels like 40, wearing all my fleece. It's bittersweet. 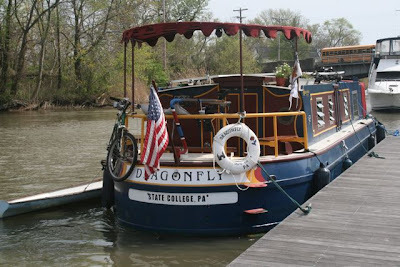 After all, the seed for this trip was planted two years ago when Cap resolved to give his dad a treat by renting a boat and cruising the Erie Canal. Driving south Tuesday we crossed the line into Virginia and the first thing we saw was an elaborate fireworks establishment, flying the Confederate flag over a billboard that read: "Welcome to Dixieland." Dixie! If you consume any media at all, you may have noticed that Tuesday also marked the 150th anniversary of the start of the Civil War. This trip has floated us past so much Civil War history. Indeed, just a few weeks ago, we visited Fort Sumter, where the first shots were fired on April 12, 1861. Our trip focuses on energy technologies, not American history or social justice. But these are hardly monolithic topics. From an economic (and a "principles of physics") perspective, the institution of slavery WAS an energy technology. It was a way to accomplish work. Slave owners used cheap human labor instead of other energy sources, such as hydropower, wind power, steam power, or horse or mule power. We're working our way up the Chesapeake. Hope to be in Annapolis this weekend. At the first "changing of the watch" this morning, SlowBoat had a moment of drama. Cap was chasing the morning chill with a steaming cuppa java. He set the cup on one of the stern seats. And in the shuffling dance to change places . . . into the drink it went. We happened to be in a bookstore with a big magazine rack, and this month's issue of Wooden Boat magazine featured, on the cover, a boat with rooftop solar panels and a hybrid diesel-electric propulsion system. Wait a minute! That sounds like SlowBoat. But I said "Wooden Boat" magazine. Yup. The featured boat is Sparks, and the latest innovation by Ted Moores of Bear Mountain Boats. Amazingly enough, we got to tour Sparks and meet Ted and his partner Joan Barrett. It was just three months into our year-long SlowBoat cruise. We landed at the town dock in the hip college town of Peterborough, Ontario, and the dockhand said, "You HAVE to go over to Dock C. There's a boat just like yours and it's launching today." We're off the boat for a week. But other boats are still cruising the Loop. 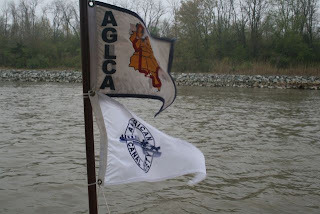 I thought you might enjoy a peek at what some our new boating friends are up to. The cruisin' Parrent Family is just crossing the border into North Carolina. We first met this inspiring family at a marina in Tennessee. Craig and Danielle decided "life's too short to put work before family,"and sold their successful business. Now they're looping AND "boat-schooling" their three extremely smart and delightful children. The Parrents' Great Adventure was punctuated recently by a moment of terror. Their boat, Negotiator, was anchored out in a cove with one other boat. During the night, a storm kicked up and both boats dragged anchor. It seemed Negotiator would be swept onto the rocks, then smashed by the second boat. But the Parrents are self-sufficient and had planned ahead for emergencies, and that preparation stood them in good stead. Danielle tells the story on their blog. You get to check out lots of boats on this trip, and early on, we admired a particular kind of blue-hulled boat called the Nordic Tug. Pete and Anna Gulick are cruising in one of these sweet little tugs, which they named Blue Yonder. We first met them on the rocky shores of Georgian Bay in Canada when both of us docked for dinner at Henry's Fish, a local institution. 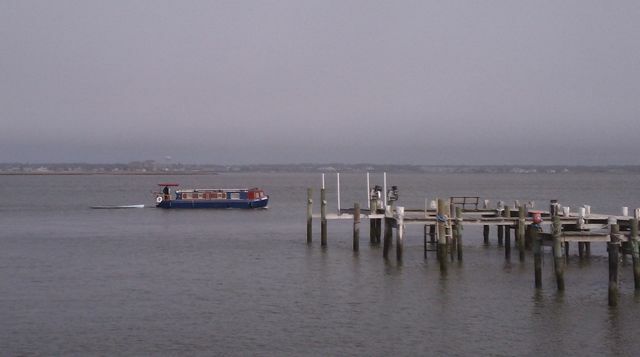 SlowBoat (the boat) is docked in Hampton, Virginia, waiting out the weather. Cap and crew are in Homer, New York with Bill's Mom. Bill's Dad, Tom Carlsen, ended his long battle with lung cancer yesterday. Tom Carlsen spent his life helping others. He was a medic in the U.S. Army, an EMT in his small rural community, a firefighter, a scout leader, a leader in his church, and, to his grandchildren, the guru of good table manners. As a professor of social work at Syracuse University, he prepared hundreds of students to do good and make a difference. It's lovely to think of his influence rippling outward in the word. We'll be here for about a week. Please do check back on the blog for some SlowBoat flashback stories and some photoessays. Your love and support means a lot to us. 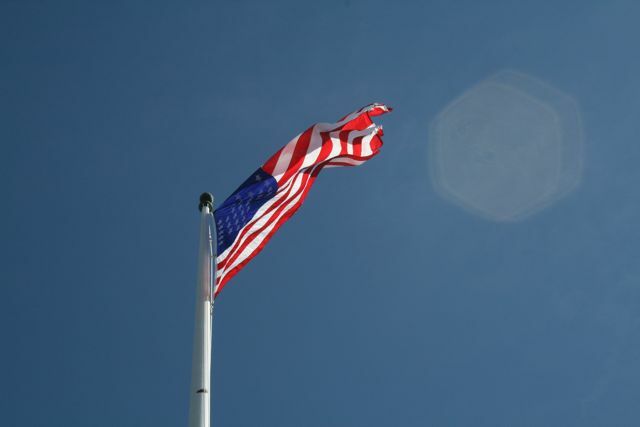 WASHINGTON, DC, APRIL 1, 2011. President Obama's position on energy policy is making headlines this week. Hidden among the heated discussions about oil, natural gas and nuclear power was this small but intriguing detail: The President's plan to rejuvenate America's canals--and add new ones. Goodbye 18-wheelers. This is the future of transportation in America. 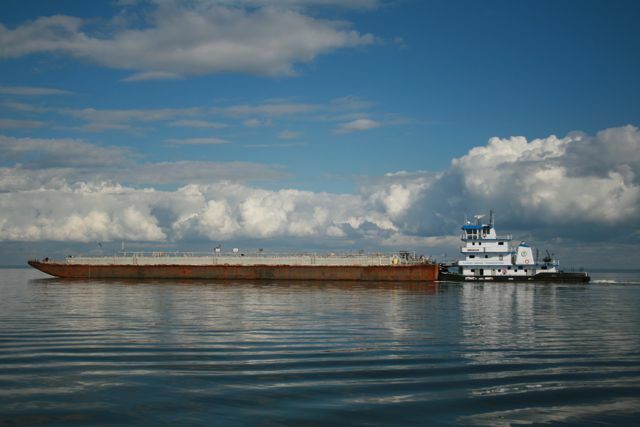 "One key to a secure energy future is conservation," said the President, "and water-borne barges are the single most energy-efficient means of transporting goods ever invented. 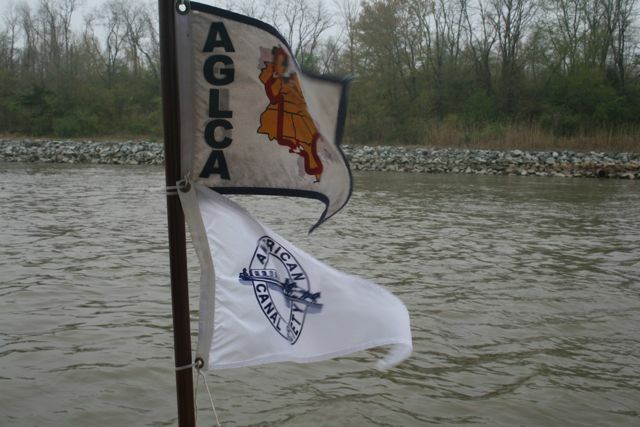 It only makes sense to adjust our supply systems for greater reliance on canals."